A friend recently e-mailed that after dieting all week, she had lost only five pounds. Instead of being happy with her progress, she was disappointed. She thought that she should have lost at least ten pounds. She didn’t fail; what she needed was a reality check on her expectations. People tend to enter into new endeavors with unreasonable expectations, and then quit because they don’t achieve their goals. If this has happened to you, perhaps you need to reevaluate your goals. People usually start physical activities such as Kickboxing or dieting with the expectation of slimming down and becoming healthier. Experts would agree that that is a reasonable expectation. However, people soon quit their programs, because they didn’t work. Were all of these programs failures or were the expectations too high? The variable not taken into consideration in these alleged failures is what were the person’s expectations? It would be unreasonable to expect to lose 10 pounds per week by cutting out the morning donut and taking kickboxing lessons twice a week. Donuts have an average of 200-300 calories each or 1400-2100 calories for the week, and the average 150-pound person taking a 45-minute kickboxing class will expend approximately 511 calories during each class. At the most, that will give you a deficit of 3122 calories. You need to expend 3500 calories to lose one pound, or 35,000 to lose 10 pounds. Those would have to be two very long kickboxing classes to keep this plan from being labeled a failure. Definitely, unrealistic. However, if you give up your morning donut plus 100 additional calories each day, take two kickboxing classes per week and walk three times a week for 30-minutes or take a third kickboxing class, you could expect to drop a healthy 1-2 pounds per week. In addition to pounds lost, you would be toning your muscles and improving your overall health. Very realistic. Successful people anticipate setbacks. What will you do if you can’t get to class? Make it up later or train at home? You forgot your lunch and only have time to hit the vending machine. Do you keep high protein-low fat emergency snacks in your car or drawer at work? Take time to plan ahead for emergency situations that are certain to occur. When expectations are realistic, the chances for succeeding are greater. Unfortunately, we live in a society that expects instantaneous results, which is why so many ventures fail. Nobody gains 10-20 pounds overnight, gets out of shape in a week. That means that realistic expectations should be used when setting goals. 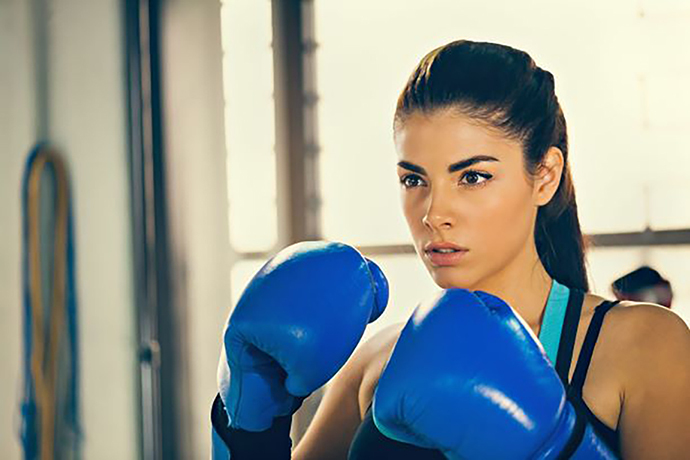 Your kickboxing instructor can assess your current level and help you develop a realistic strategy to follow that will help you succeed. So what are you waiting for? We can help you set realistic goals and expectations to meet your fitness needs. Give us a call right now at 757-410-4999 to get started today! Join the fun at King Tiger Martial Arts where you’ll experience expert training in a fun, positive and supportive environment suitable for everyone in your family. Or simply fill out the box in the upper right corner and take advantage of our FREE 30 Day Trial Membership!